It's from the people at DuoFertility. They can afford the price of a stamp, as they don't have to refund our purchase price. In addition to the card, which I thought was very sweet, they also sent us a parcel of freebies, including Pregnacare tablets, iron supplements, and even a baby-gro. I have to say, I've been impressed with them from day one. The DuoFertility gadget would automatically send Lisa's temperature data to Cambridge every time we connected it to the computer, and as a result, they knew she was pregnant before most of my family. They actually e-mailed Lisa in December to say that just by looking at her temperature records, they thought she was up the duff. When I paid that £500 last May, I thought I was just getting an electronic gadget, but we actually got a great service too. Not to mention a baby. 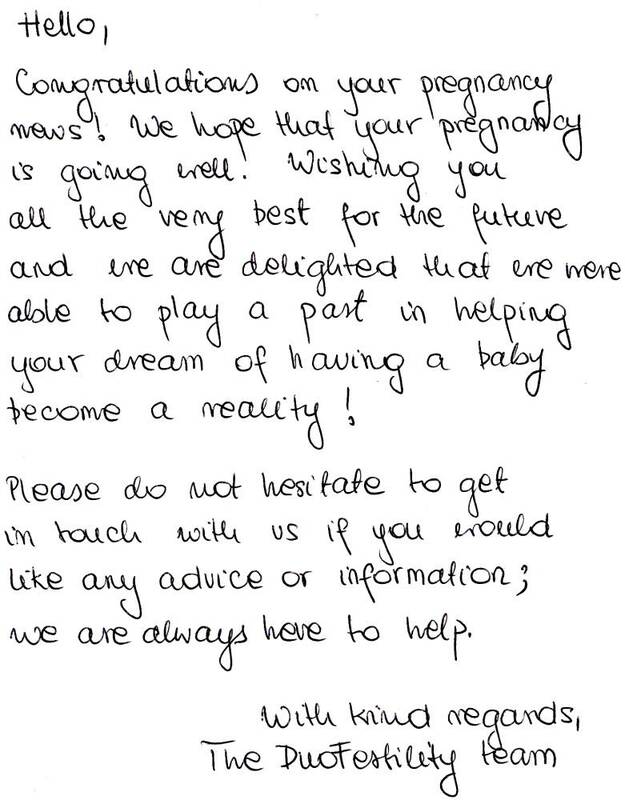 They were constantly in touch with advice, and even now Lisa's pregnant, they're still sending us stuff. 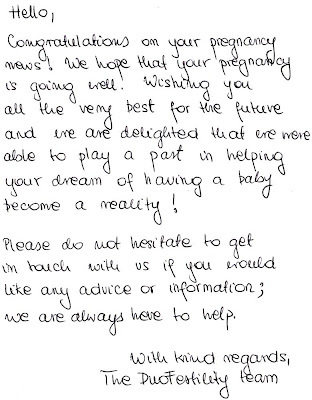 Frankly I don't know why anyone chooses IVF. This was a much better investment. But while we celebrate our new half-a-baby, we're still struggling to cope with our first. Since Shimmy took up residence here eleven days ago, Amelie's become the Wile E Coyote to her Roadrunner. If she had access to the Acme catalogue, we'd be bankrupt by now. Shimmy spends most of her life being chased, hugged, poked and carried, and whilst she's remarkably patient with our daughter, Lisa and I fear for her mental health. With this level of harassment, she could be heading for a nervous breakdown. Only this morning, I heard a distress call from the next room, and shouted "Amelie, are you making those cats squeal?". To which she replied, "No, Daddy. Just one of them". 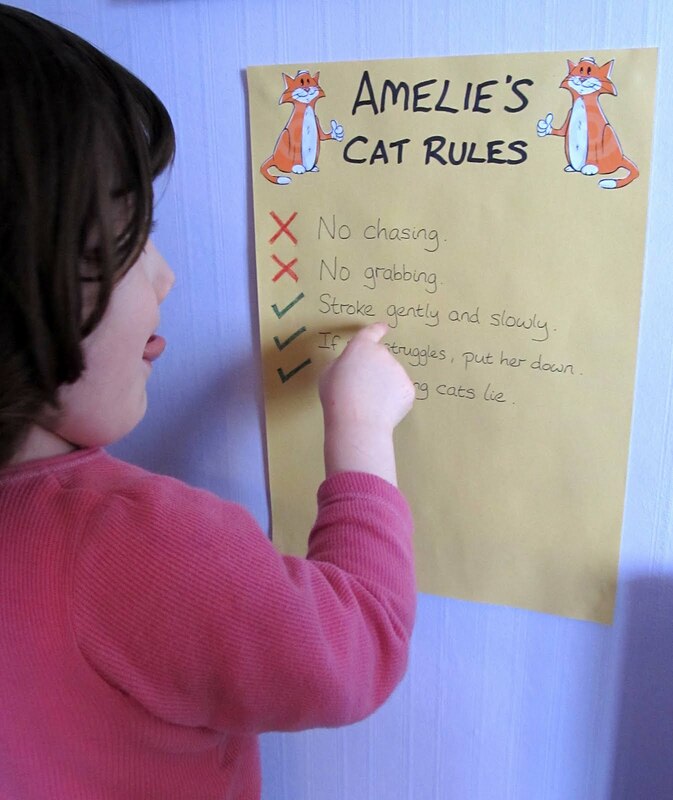 So while Lisa had a lie-in this morning, I set about making Amelie a list of Cat Rules. We began with a consultation period and brainstorming session, during which I discussed with Amelie the do's and don'ts of cat care, and suggested some possible ground rules. To give her credit, she was very enthusiastic, although I'm not sure she quite grasped the concept of what we were trying to do. When I asked her to suggest some rules, she came up with 'No cats allowed to do gluing' and 'No cats allowed to drink fizzy drinks'. I had to start a second list, just so she could write those down. "I wanted you to write 'No Scratching'!!!" 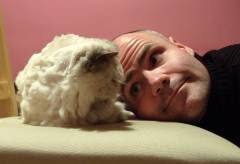 When you have written the next "cat rule" you'll have to teach Shimmy to read!